Almost forty years have passed since the release of Bridge Over Troubled Water, Simon & Garfunkel’s swan song. While they’ve collaborated on various projects and shared concert stages in the intervening decades, this landmark effort remains the duo’s final studio LP. Not long before Bridge entered the consciousness of a generation, Simon & Garfunkel embarked on what would amount to being their final concert tour as a current act. This closing chapter — epilogues notwithstanding — is exceptionally preserved and chronicled on Live 1969. Considering the relative brevity of their musical partnership, even the eldest of S&G songs performed here — “The Sound of Silence,” “Kathy’s Song,” “Leaves That Are Green,” and “I Am A Rock” — had yet succumbed to the whims of nostalgia. As such, they’re presented from a contemporary perspective, which distinguishes this live album from subsequent ones — The Concert in Central Park (1982) and Old Friends (2004) — not just in how the material is received by audiences, but also in how it’s presented to them. “This is also one of our new songs,” Paul Simon timidly remarks at one point. “It’s called ‘Bridge Over Troubled Water,’” enunciating each word in case anyone may want to hear it again once the new album comes out. The merits of his songwriting aside, whether strumming his guitar in accompaniment or even when singing lead, Simon maintains an inconspicuous, concentrated presence throughout. It’s Garfunkel who shines brightest here, be it with wistful variations on “So Long, Frank Lloyd Wright” or in pining, seraphic passages of “For Emily, Wherever I May Find Her.” And, even if all you had to go by was the tremendous ovation following “Bridge Over Troubled Water,” it’s safe to say he does a mighty fine job on that one as well. 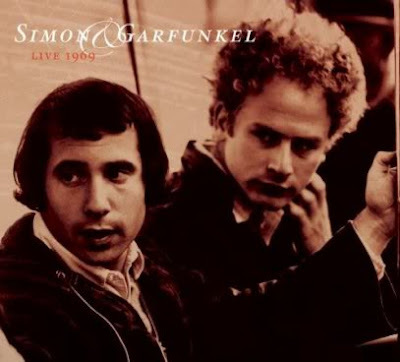 Live 1969 finds Simon & Garfunkel toward the end of their run yet very much in their prime, enriching their works with indelible chemistry and respective fidelities to their craft.